What if a Jew swims against the stream of Zionism? On March 2, 2014, hundreds of thousands of Haredi (ultra-orthodox) Jews came together in Jerusalem. They protested against an amendment to the Israeli conscription law that would no longer exempt students of the Torah from compulsory military service. The new law puts in doubt an entire system of agreements made between David Ben-Gurion, the first Prime Minister of Israel, and non-Zionist Haredi rabbis in 1948. Ben-Gurion, convinced that Judaism would die out, was buying time and trying to calm down the rabbis' opposition to the Zionist state. Ben-Gurion's prediction has proven wrong. More than a million Israelis now consider themselves Haredim, and they remain aloof from the country's secular majority. The demonstration last March was not the first such confrontation between Haredi Jews and the State of Israel. Yakov M. Rabkin, a Soviet-born Jew who has taught at the University of Montreal in Canada for over forty years, has critically analysed the relations between Zionism and Judaism, and between Jews and the State of Israel. In his academic work, he dispels confusions about Zionism and Judaism, and investigates relations between Zionism and anti-Semitism. While teaching contemporary Jewish history he has studied Judaism with rabbis in Montreal, Paris and Jerusalem. He has also carried out academic studies on the history of science and technology, Jewish history, and has been active in interfaith dialogue. His 2004 book, "A Threat from Within: A Century of Jewish Opposition to Zionism," grabbed worldwide attention and has been translated into a dozen of languages, including Hebrew and Turkish. In the book he sheds light on the rejection of Zionism on the part of most prominent rabbis of the past one hundred and fifty years. It is crucial to know what Zionism really is in order to comprehend all debates for and against it. That is why Rabkin begins by defining Zionism: "Zionism is an attempt to gather Jews in the Holy Land by political, physical means." And shortly after, he outlines the birth of Zionism as a political ideology. Secularization and nationalism in Europe, particularly in Eastern Europe, enabled thousands of European Jews to embrace Zionism, leaving behind their commitment to Torah and its commandments. It is these "secular Jews" who unilaterally declared the independence of Israel in 1948, and have largely governed the country ever since. It was Theodor Herzl, a Budapest-born Jew profoundly estranged from Judaism, who is considered the father of modern political Zionism. He formed the World Zionist Organization and promoted Jewish migration to Palestine with the purpose of forming a Jewish state. Rabkin emphasizes the Eastern European, particularly Russian, influence on Zionism. "This Eastern European influence is still very strong in Israel. All the prime ministers of Israel without exception were either born in the Russian Empire or come from parents who were born in the Russian Empire. They all come from little towns, none of them come from big cosmopolitan cities like Paris, Saint-Petersburg or Istanbul. No wonder they recreated a ghetto in the Holy Land." The original idea of physical, material gathering Jews in Palestine is of Protestant Christian origin. After two centuries of rather marginal existence, this idea gathered momentum in mid-19th century. While still unknown to the Jews, it penetrated the corridors of power in London as it dovetailed with British imperial policies, looking for a reliable foothold in the Middle East. And it was only 50 years later, by the end of the 19th century, that Zionism acquired first adepts among some Jews in Eastern Europe. It is this small minority of Jews that became the pioneers of a new state in the Middle East. This secular minority had no use for Judaism and its moral values, it was determined to act. Rabkin says: "Jews, including myself, pray three or four times a day for the return to the Holy Land. But praying for something and actually taking it from its owner are two different things." Quite a few people believe that all Jews are Zionists. This is a cardinal belief of the Zionists, who claim to be "the vanguard of the Jewish people". This confusion between Jews and Zionists is a political misconception and a source of danger. Some Muslim and other media blame local Jews for the way Israel treats Palestinians. This is not only unfair because local Jews have zero influence on Israel's policies. It is also ironic because those very media that claim to be opposed to Zionism have in fact become purveyors of the Zionist ideology that conflates Jews and Zionists, local Jewish communities and the State of Israel. "Israel calls itself a Jewish state and claims to belong to all the Jews of the world. But most of the Jews of the world prefer to live outside of Israel. And apparently, about a million Israelis also live outside of Israel." Are those who oppose Zionism anti-Semitic? Criticism of Israel is often confused with anti-Semitism. Indeed, quite a few anti-Semites criticize Israel. But the protagonists of Rabkin's book are most prominent rabbis of the last century, and nobody would call them anti-Semites. This is why the book has attracted so much attention around the world. Some people are unhappy that the book sheds light on the fundamental differences between Zionism and Judaism. They would rather silence this whole issue. But Rabkin believes that intellectuals must explore such issues even if they go against the current. "Let me tell you an old Jewish story. When one does not know if the fish one has bought is dead or alive, one must put it in a stream. If it swims against the current, this shows it is alive". The emergence of nationalism in Europe in the 19th century transformed many countries on the continent and rebuilt them with new secular, national identities. According to Rabkin, such a historic transformation constitutes a common ground for Turkey and Israel in terms of building new secular identities, language reform and regional issues. He points out that "Ottoman identity was not a national identity just like Jewish identity is not a national identity." Another parallel between Turkey and Israel, Rabkin adds, is the stance of their first leaders, Mustafa Kemal Atatürk and David Ben-Gurion, respectively. "The perception of Atatürk and the perception of Ben-Gurion was nearly the same. For them, religion is a thing of the past. … For Ben-Gurion, religion was to die away within a generation or two. However, it did not happen this way, and the numbers of religious Jews keep growing. Turkey also has known a movement back to Islam." Jews have lived as a minority for millennia. In Christian lands they experienced a lot more persecution than under Islam. In the Ottoman Empire, including the Holy Land, Jews, Muslims and Christians lived together in relative harmony. 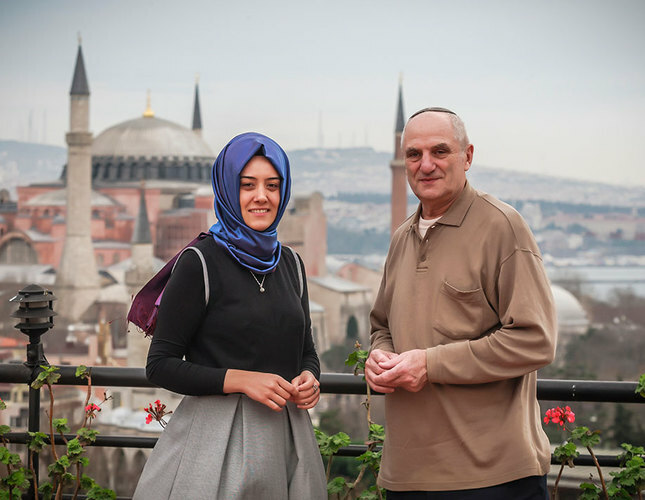 For Jews, Istanbul was the most peaceful corner of Europe for many centuries. This coexistence must continue. Zionism aimed at and succeeded in building up a Jewish majority in Israel/Palestine, which engendered the century-old conflict. But Rabkin is quite hopeful about prospects for peace: "I am an optimist, even though peace will require tremendous efforts. I believe that there can be no peace without justice. Economically and politically, the Palestinians today are much weaker than the Israelis. Stability demands balance. Many Palestinians lost their houses, their lands since 1947, and they ought to be compensated for lost property. For instance there was a Palestinian village where the campus of Tel Aviv University stands today. Nobody suggests to rebuild that village, but its former residents and their heirs must be compensated." Rabkin also published a book this year, "Comprendre l'Etat d'Israël" (Understanding the State of Israel), which offers a new perspective on the Israel-Palestine conflict. And always as a swimmer against the current, his new book should bring a new breath to our understanding of Israel.